Kim is going on 7 dates, can you help her to find her perfect man? On your wedding day, you want to be able to take some time off and just relax. All of your planning has come to a head! Now you can just focus on looking beautiful on your wedding day! Aprils wedding day is coming, dress her up and select the nice gown for her to match her hair and everything else. 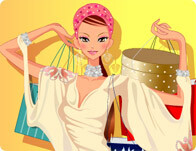 Help this young bride dressup for her special day? You have all the coolest dresses to pick from! This blushing bride needs some fashionable friends to make her special day more stylish. Dress up these two best buds in matching tops, bottoms, or gowns for a magical day of matrimony and mirth.